I've been searching for a way to give you a piece of our process without sharing drawings or any specific details that might spoil it for the guests. I also think it's important for prospective clients and readers to catch a glimpse behind the gilded curtain, so to speak. To really get a sense of what it takes to pull a Goldiluxe event together. So, I thought a new segment was is order. I give you: Under the Glitz. The title's in flux, so sue me. Here we go! It's coming together, y'all! Lets take a look at what we've got, shall we? 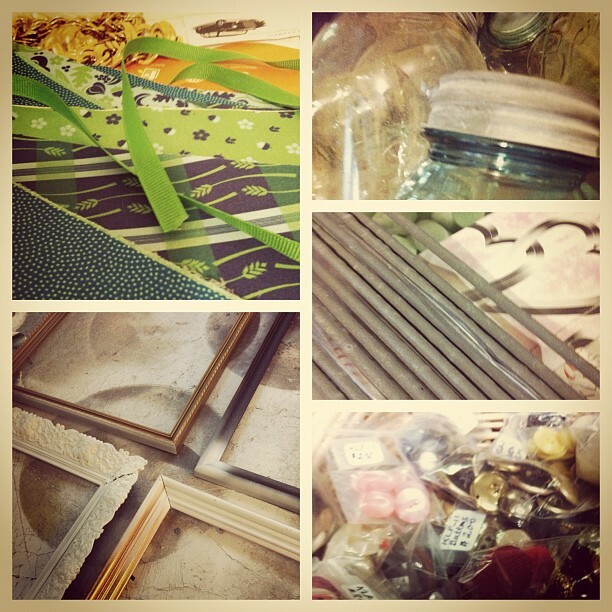 Underneath that, we've got some picture frames getting Goldified! Between my stash and the generosity of GoldiFriend, Kate Funk, we were able to snag lots of fab frames for zero coin. We love to scavenge and bargain. It's a great chance for us to stretch our imaginations and use a little ingenuity. It may take longer than sourcing ready-made, but we think the extra effort to stick within budget means more to our couples. We're really turning up the rusticity of this event and I really wanted to bring in some elements of home decor, but re-imagined to fit our 'rustic-chic' mood. The frames have been painted and are now awaiting their finishing touches. It's gonna be KYOOT! Next, I've got a stockpile of amazing vintage mason jars. I have been scouting antique stores for months to find the perfect ones! Because the Mason Jar is an outrageously popular collector's item, they are quite pricey and can be really cost-prohibitive. So, to compensate, we've filled in with newer and reclaimed jars. We've saved our couple a lot of money, but they didn't have to compromise on style. The stately little jars will be popping up all over the event, so stay tuned! I wish I could tell you more about the photo in the middle. I really do. But, if I talk it may give away too much...so all I'll say is that we will not be without the perfect July accessory. The final picture in our little group is part of my latest haul from my favorite antique hunting ground, Antiques on Second. They literally have everything. I had a lot of luck there last time, so much luck in fact I can't show you the best parts. Just know Country Wedding is chock full of charming vintage touches that enhance the rustic gorgeousness of the venue. Classy, not kitschy, y'all! There you have it! A peek at what it takes to create the quintessential Goldiluxe event. Any questions about the process? We'd love to chat with you! Leave your questions in the comments or e-mail me at: goldiluxeevents@gmail.com. With summer in high gear, I've been getting lots of letters from you about showcasing some fun, flirty dresses fit for you're amazing affairs. It seems you're getting married in Vegas, in gardens, museums, art galleries and posh, upscale dining establishments. In order to give you some variety, I went to three of my favorite stores to round up, what I think, are really great options to get you started! 1. First up, we have this little number from Sue Wong. I am a huge fan of this beige, embellished illusion bodice dress. At $398, it's kind of a steal. 2. This is the Telago dress from one of my favorites, Ted Baker. I love the high neck (usually, not so much) and the delicate detail really does bring it home for me. This one will run you a little more, $825. I think it'd be worth it, though, to tell you the truth. 3. Finally, I found this sweet little diddy from Rachel Zoe. Now, if you know me, you know I'm not a huge fan of Rachel Zoe's line. It's just not me, but I think this short, metallic brocade dress is super charming. It's got a bit of a retro vine to which I am drawn. 1. I love the Comme Il Faut dress from Hitherto. I am literally choking on all the fab. One of you wrote in about a retro-inspired reception at a supper club. Let me say it again. I LOVE that idea. I think it's going to be fabulous. And, please, consider this dress. At $800, it's a pretty great deal. 2. This is the Arabesque dress from Yoana Baraschi. I love everything about this dress, y'all. I think the detail is phenomenal. 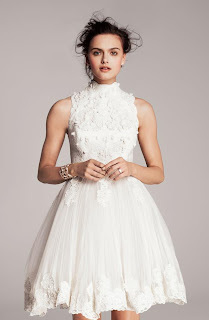 I haven't seen a lot of short wedding dresses quite like this. I really appreciate the evening gown feel it brings. Three quarter sleeves. Yes. This beauty comes in at $300, proving great style doesn't have to put you in the poorhouse. 3. Say hello to Persephone, by Tracy Reese. I am a huge Tracy Reese fan. This dress is deliciously elegant without so much as a hint of pompous excess. Those bell sleeves are adorable! A word, dolls. Shift dresses can be a bit tricky. If you have a BHLDN near you, try this baby on. You don't want to have a $400 disaster on your hands. 1. I love this dress. I am so glad that the peplum is back. I really am. I love how cute and 50's it is. The Cha-Cha dress has an adorable cut out in the back. Can't you just see this at a chic gallery wedding. I'm seeing simple, classic lines with pops of bright colors. 2. A great, little embroidered feather dress. Love it. Love the length, love the feathers, love it all. You should check out the sweet embroidered bib. It's pretty great. I hope these little cuties have given you all something to think about. Have something to say? Leave it in the comments! Helurr! I'm so happy to be back! June has been totally cray-cray around here (so many posts to come) and I'm afraid I've neglected you. On to today's topic! I just had the pleasure of organizing (along with a couple of my fave ladies) and attending one of the best bachelorette parties ever! I mean we had a blast together. It was so great in fact, I think I am still riding pretty high, three days later. So, in an attempt to carry this great feeling with me a little longer, I thought I might answer some of your bach party-related inquiries. Enjoy! 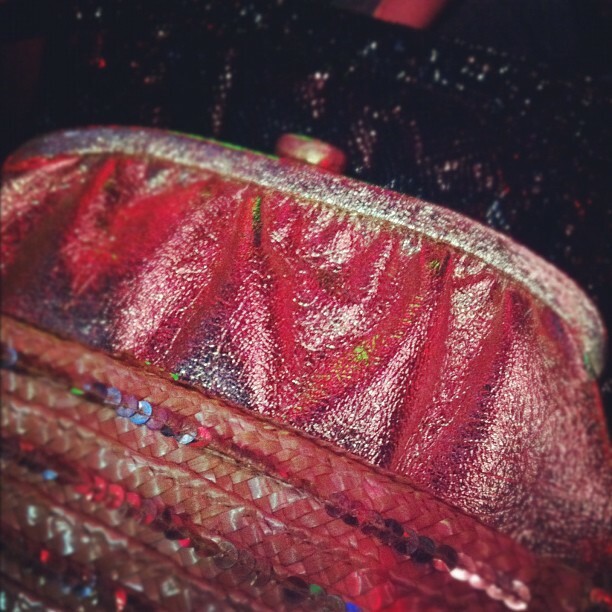 Cute, glittery clutches helped set the stage for our glitzy party! Are x-rated inflatables still a thing for bachlorette parties?! How do I tell my girls I don't want a dirty, peenie-infested, trashy party without hurting their feelings? Well, doll, I hate to tell you but adult inflatables still seem to be all the rage in most of your garden variety parties. I know. I don't get it, either. I was right where you're at, sister. Luckily, my maids knew I wasn't that kind of girl so I had it pretty easy. Honesty is always the best policy. Just be firm, candid and tactful with your 'maids and they'll understand. They love you and just want to send you down to matrimonytown in style. So, tell them what that means to you. How much input should the bride have about her party? We want to surprise her, but we don't want to choose the wrong thing...so, what can we do? I think the best way to include the bride without giving away the farm is to have her make a list of some of her favorite places. I mean, have her pick her top fives or something. Restaurants, bars, clubs, destinations, landmarks...you get it. Now you have a bunch of bride-approved spots, but you still get to surprise her with a fun, unique party she'll remember for a lifetime. 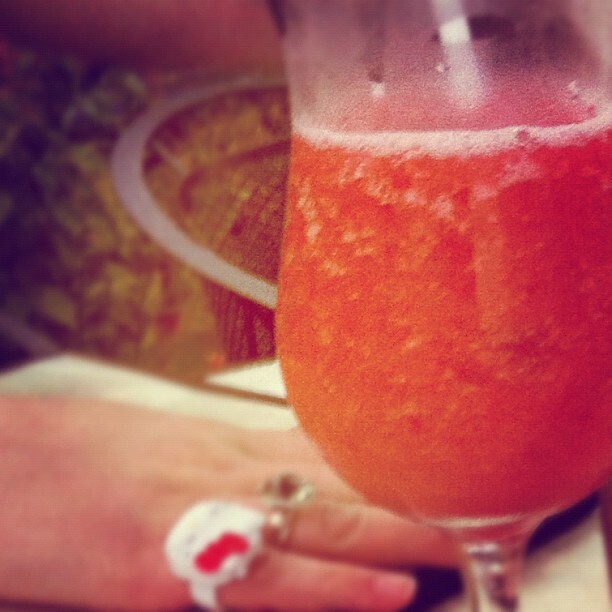 Hello Kitty rings and frosty bevvies helped kick this bach party into high gear! We're going to din din, them out on the town. We still want to incorporate some games. When is the best time? What games should we play? I think the best time for games is during dinner. You've all got some drinks, maybe a starter or two and best of all, everyone is excited for the festivities to start. I also suggest limiting the games to one, maybe two. As for what to play? My all time, favorite game to play is: Bachelorette Party Mad-libs. It's cute, sassy and good for a lot of laughs. Any thoughts on going to strippers? Yes. Don't. I don't care for strippers, personally. I think bach parties should be about sending your friend into married life with some class and grace. Not chasing after peenies and asking strange men to buy you drinks. But, to each their own, I suppose. I want to go out of town on a girl's weekend. I keep imagining us flitting around the city in cute dresses. Is that to much to ask of my bridesmaids, financially speaking? Ask them. Tell them what you're thinking and ask them how they feel. If you are located near a major city, could you drive there or take the train? This could eliminate airfare and take some of the burden off your guests. If not, perhaps you could think of other ways to lighten the money load...pay part of the hotel bill? Take them out to dinner? Pick up part of the tab? Bottom line: Don't tell them you want to go out of town and then expect them to foot the entire bill. It's not nice. You guys asked some great questions! Y'all are so smart. I hope this quick little roundup will help you navigate the dark and glittery waters of bachelorette party planning. Have fun, cupcakes! Did I miss something? wanna put your two cents in? Feel free to leave it in the comments! On May 19th, we honored a very dear friend of mine with a bridal shower. Allison actually suggested the 'ironic princess' theme to me and Fractured Fairytale was born. We pinned our stylish little hearts out and filled our pinboard with the best, non-vom inducing princess inspiration the Internet had to offer. If you ask me, it turned out pretty great! Gah! So cute! I love those golden deer. When Allison showed them to me I knew they'd be perfect. Also, if you'll notice, you can see the little vase in the background is a tree trunk. To add a little extra pizazz, we framed one of the invites we had and set it up at the end of the food station. That big, diamond is a paperweight I have. At home, it sits on my desk, glittering happily at all who walk by. And besides, you can't have a princess party without a giant diamond, can you? Speaking of which, instead of doing traditional favors, we thought it would be cute to hand out enchanted cocktail rings. It was a huge success! We made adorable favor tags, handed a few out as prizes for Charise-themed games, and made sure everyone got one before the party ended. Ooh, also, you can see the prize ribbon we made for Charise to wear. We have been bored with generic party accessories for awhile now, espesh where tiaras and sashes are concerned. So, we took matters into our own hands and have been crafting cute things like this! Goldiluxe honorees should feel special and celebrated! We cut up strips of fancy paper, rounded up our prettiest pens and encouraged the guests to write a short note of encouragement, a sweet wish or a piece of valuable advice. Then we added all the wishes to a little pouch for the lovebirds to read before the wedding. Just a little extra love for the big day! Here's a close up on some of our signage. You can also see another one of our little tableau. Those vases are killing me! So dang cute! Our darling bride wanted a fun, low key bridal shower with plenty of pizzazz. I think we accomplished that! We showered her with handmade, vintage or gently-used gifts (a story for another post, I think), dined on yummy, home-cooked food and sipped on cocktails from the mimosa bar. For more Fractured Fairytale cuteness, visit our Facebook photo album!